Awesomes, this is an episode quite unlike any other we've ever created. We're bringing you a peek behind the curtain of podcast production, and you'll quickly agree with us that honestly, we have no idea what we are doing. Join Meg and Laura in this completely un-produced, real life, real talk conversation about how difficult it has been for them to figure out how to structure their days and get stuff done as work at home moms. No matter your own vocation, work situation, or calling, you might hear a tidbit or two to inspire how you spend your days, and you'll most certainly be able to give us some advice on how to get our acts together! All of that plus Awesome of the Week! 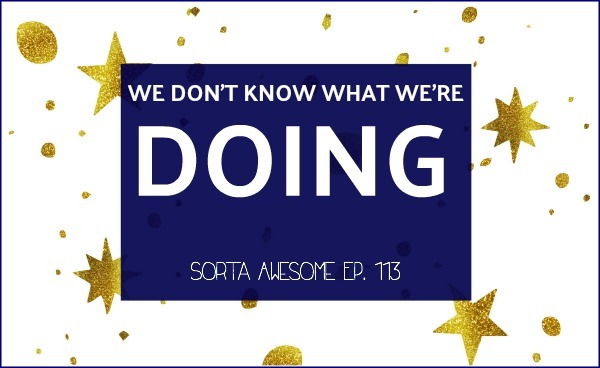 Find out how to become a Sorta Awesome listener-supporter!